I hope that it never happens to you. You get off your bicycle and notice bike grease on your favorite pair of pants. Oh no! You’re quickly questioning if its even possible to get the black grease stain off your clothes. The good news is that your favorite article of clothing isn’t ruined. There is hope! Here’s a few different methods that you can use to remove bike grease from clothes. One of the easiest ways to get bike grease out of clothes is with dish soap. Place dish soap onto the area and gently rub it into the grease stain. Once it’s rubbed in let the soap soak in and do its work breaking down the grease for about 10 minutes. Once ten minutes have passed run hot water over the area to rinse away the grease. At this point you may need to reapply more dish soap and use a rag or dish washing brush to rub at the area. Continue to rinse with water, using more dish soap and scrubbing with rag until the grease is gone! This method of removing bicycle grease is best on clothes that are more delicate (silk and wool). Pour a bit of baking soda directly onto the stain. Let the baking soda stay on the clothes for 6-8 hours. The baking soda will draw out the grease and oil from the article of clothing. Wipe off the baking soda, and the bike grease should be mostly absorbed from the piece of clothing. Wash the piece of clothing according to what it says on the label. If it’s a delicate piece of clothing you can hand wash it or put it on a delicate cycle in your clothes washer. Let the piece of clothing air dry to see if the stain has been removed. The best time to tackle a grease stain is as soon as possible. It’s easier to remove the grease when it is fresh, but perhaps you just noticed the stain on your pant leg and it has already dried on. Even worse perhaps you’ve noticed the stain after the article of clothing has been taken out of the dryer. 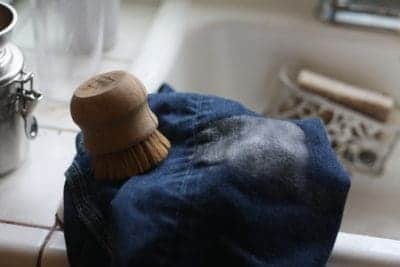 Before you pass judgement on this piece of clothing, give this method of grease removal a try. Lavish the stain with a hefty amount of WD-40 (see on Amazon). WD-40 can help make even a dry stain, become a fresh stain again. Let the WD-40 sit on the grease stain for 30 minutes to allow it to fully soak in. Rinse the spot with hot water to remove the oil. Cover the area with liquid laundry detergent, and carefully massage the detergent into the stained area. Let the laundry detergent sit on the stain for 30 minutes. Check the article of clothing’s label, and wash it in the hottest water recommended. Inspect the area to see if the stain is gone. Don’t dry until you know the stain has been removed. If the stain is still there repeat this entire procedure until the stain is gone or until its clear that this method is not improving the situation. One of the best ways to avoid having to get rid of bike grease from your clothes is by keeping your bike chain clean. 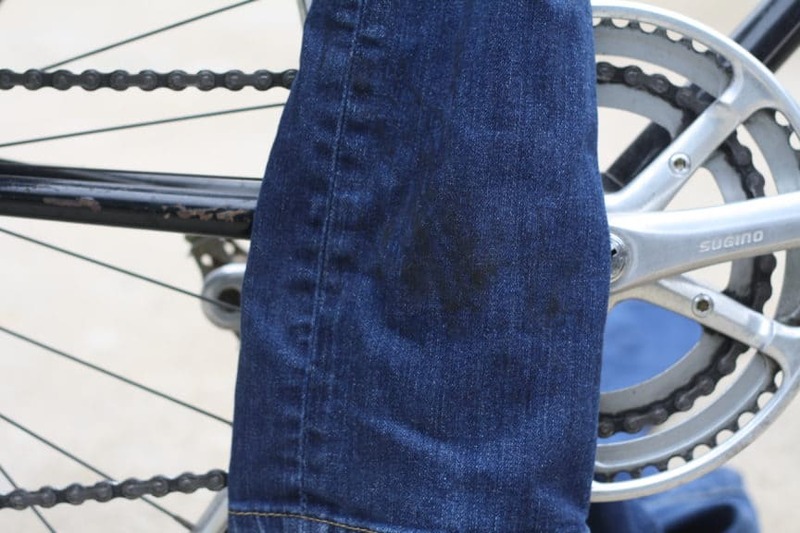 If you’ve arrived at this article it’s probably too late for this time around, but take a preventative measure to make sure you don’t find yourself trying to get bike grease off your pants again! Personally one of the easiest ways to keep your bike chain clean is with Park Tool Cleaning System. It makes it incredibly easy to clean and re-lubricate your bike chain. It’s simple to use, and is worth the investment. You can see this tool on Amazon by clicking here. Here’s a short video by the manufacturers on how it works. Like I said…very simple! The other option to clean your bike chain is with a simple rag. Apply a bike chain cleaning fluid to your chain, and use a rag to wipe off grease from the chain, chain rings, and cassette. Once the grease is removed you’ll need to dry everything with a fresh rag. Once dry, apply a lubricant to keep the chain from rusting and to keep it working smoothly. A clean bike chain will last longer, your bike will shift and work better, and most importantly it is hard to get bike grease on your clothes if it’s not there! The easiest method is to use dish soap and a stiff brush. Sud up your hands with soap, and give them a good scrub! Another option is to use degreaser wipes (on Amazon here). They are a simple and quick way to clean grease off your hands before rinsing them off in the sink. Degreaser wipes are also helpful for wiping down your bike, and can also be used as a first step to tackling grease on clothes. They won’t fully remove a stain, but can remove the bulk of the grease until you’re able to fully clean your clothes. 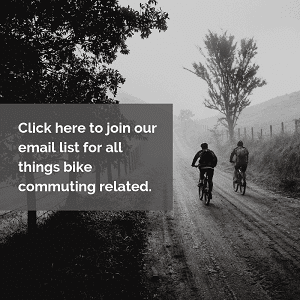 You could bring degreaser wipes with you on your commute by placing a few in a ziplock bag to keep them fresh, and just keep them in your pannier in case they’re ever needed. 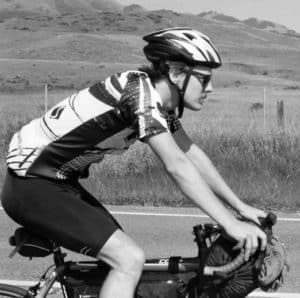 I hope this article helped you get rid of your bike grease problem! Riding a bike is an absolute joy, but from time to time you may have to deal with bike grease. I hope one of the solutions given here was able to help you remove a stain quickly and simply. 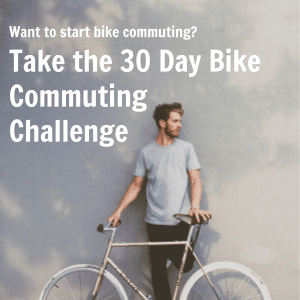 Enjoy your bike and remember to keep that chain clean!